I remember the time my sister asked me to help reupholster dining room chairs and I thought, "How do I get out of this one?" It sounded so labor intensive and to be honest, I didn't think I had it in me to take on such a project. However, my sister does not take no for an answer. The next day we got started with just a few tools. I watched as the seat came off the bottom of the chair with just a screw driver. "Well, that was easy" I thought, and then I starting pulling out the staples from the bottom of the seat in order to remove the bottom cloth from the chair. Here I had to put in a little effort but I do like a challenge once I get started onto something. The fun part was lining up the new colorful fabric and then stapling it into place. Just be sure you have it centered. I learned that the hard way. Nobody likes doing things over and want to save you the trouble. Then we replaced the seats back onto the bottom of the chairs. One after the other and soon enough we completed all six. Done and done! They looked so much better. Oh and I didn't stop at dining room chairs. As soon as I got my new vanity set the first thing I did was went out and bought fabric to reupholster the stool. I'm good at the reupholstering part now but I bought way too much fabric, oops. 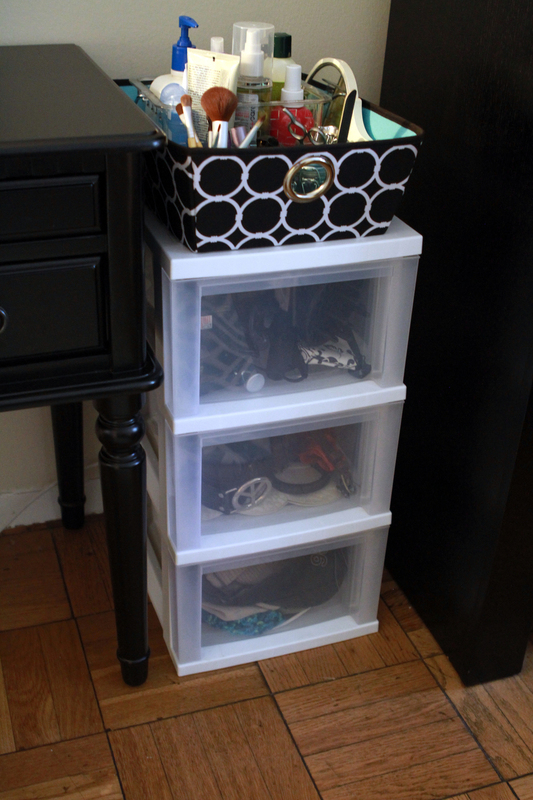 So, I used the extra fabric on these inexpensive plastic drawers. I think I paid $15 for them and I was about to get rid of them. I never really liked them because you can see through the plastic and they just look cheap. So, with my handy dandy hot glue gun, I hot glued a piece of fabric on the front of each drawer. Now you can't see the items that I have in them and they look great with the stool. Trying new things can always seem a little daunting but I ended up liking it. You may enjoy it as well. I was going to write out the steps on how to reupholster a chair for you but why bother when its already done on wikiHow.